It may seem unconventional to begin a thesis in arts administration by discussing a football stadium. This thesis is an exploration of urban planning in Los Angeles involving large-scale, public-private development. 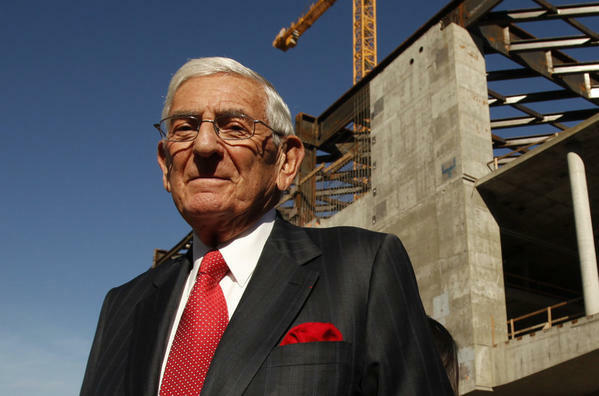 In the following chapters, I document how philanthropist Eli Broad’s under-construction contemporary art museum, The Broad, is being utilized to stimulate further redevelopment of an area of downtown Los Angeles called Bunker Hill. The Broad museum and the larger, coinciding Grand Avenue Project has engendered some conversation about the investment associated with public-private development projects, and the resulting public and private benefits. However, the amount of dialogue about investment and return benefit involved with the Broad museum and Grand Avenue is minimal in comparison to another large-scale, public-private development proposal less than two miles away: Farmer’s Field. The proposed downtown National Football League stadium has garnered substantial, well-publicized and in-depth political, social, and economic debate about investments and benefits. For this reason, I believe reflecting on some of the lively discussions circulating abound Farmer’s Field can be useful in introducing similar questions and concerns, which may not have been addressed or considered, or worse ignored, in the planning process of The Broad museum. It is a plotline ripped from the popular television show Entourage (season 7 to be specific). Big-time developer Anschutz Entertainment Group (AEG) wants to bring the NFL back to Los Angeles. AEG’s tactic to lure a franchise to the city is to build a brand new 1.3 billion stadium in downtown. The new stadium, which AEG has already sold naming rights to, will be called Farmers Field, after the insurance company. AEG plans to squeeze the 72,000-seat stadium into the already dense LA Live—an entertainment and sports cluster, which AEG has spent more than a decade developing between the Figueroa corridor and the 110 Freeway. LA Live includes the Staples Center (home to both the Lakers and Clippers NBA franchises), Nokia Theaters, Regal Cinemas, JW Marriott and Ritz Carlton, and Grammy Museum. AEG has appealed for both public and government support of the project by communicating its record of success and by touting a lengthy list of impressive economic benefits, which AEG claims, the city would receive should the NFL return: tens of thousands of jobs, construction of nearby hotels, a revived Convention Center, and hundreds of millions of dollars in increased economic activity. [ii] The economic influence seems incalculable and the project non-negotiable. Does (downtown) Los Angeles need an NFL stadium?